On New Year’s Day, while walking down 10th St. NW near the heart of the financial district, I came across a quaint looking building, beaming like a sore thumb amidst an ocean of modern glass and steel structures. When I noticed the large “Bistro” sign in the window, it thrilled me to know that there was a French eatery in the heart of town. After having reviewed other French establishments in the MD suburbs (See K Town Bistro) and in the VA neighborhood of Alexandria (See Yves Bistro), I was eager to add a downtown locale to the list of restaurants of one of my favorite cuisines. 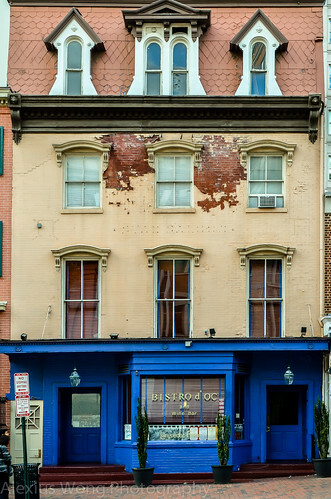 Located across the street from the infamous Ford’s Theater in which President Abraham Lincoln was assassinated, Bistro D’oc sits in a wooden and brick structure dating back to the 1830’s. Walking through its doors you are immediately assaulted by the rich orange walls and deep ocean blue trimmings that evoke the colors of the Mediterranean. This establishment celebrates the traditions and regional cuisine of Languedoc, hence the restaurant’s name, serving dishes commonly found in that southwest French province that borders Spain and the Mediterranean. In addition to the bright color scheme, you are immediately transported to a different ambience that is a prelude of what to expect from a dining experience enhanced by the surrounding wooden structure, the old wall sconces, and the side furniture that evoke a yesteryear. On my first visit, I invited my BFF to join me for dinner to celebrate my birthday. 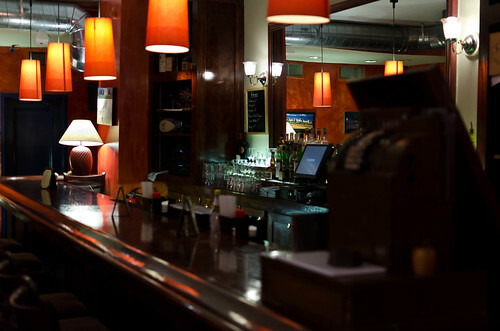 From the moment of taking a seat, the attention to details are noticeable by the diner. 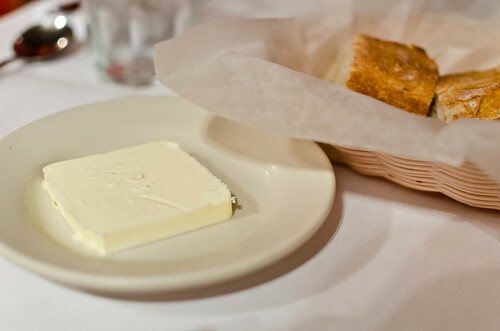 A complementary serving of bread and butter sets itself apart from the usual humdrum. Here we have a large slab of fresh butter that is a far cry from the chintzy prepackaged little aluminium foil squares. The French bread is truly veritable in quality with the hard outer crust covering an airy yet hearty flavorful inside. On another visit, the glass of Burgundy that came as part of the $25 Pre/Post-Theater dinner was decent for a house wine that was low in tannin and rather full in body. It is the attention to these minor details that sets the right mood for the rest of the meal. For the appetizer on this occasion, I honed in on a vegetarian dish listed as a special, Eggplant Paté. It arrived in a beautiful Le Creuset mini pot (I looked at its bottom) along with a few home-made croutons. Digging into the pot, I was incredulous at the dish that consisted of just roasted eggplant due to the rich flavors that permeated each mouthful. Smooth bits of roasted eggplant are held in suspension by a rich puree that has been scented by some woodsy-minty thyme that added the note of interest. Bits of cooked tomato contributed some slight sweetness to the whole dish. The croutons were thin enough yet crusty to support a mound of this deliciousness but they quickly ran out before I reached the bottom of the pot – thank goodness for the slices of that tasty baguette. This was truly a wonderfully delicious vegetarian paté, if there were one. Since my BFF was on his drastic diet for his upcoming Caribbean cruise, he opted for the Salad Languedoc. 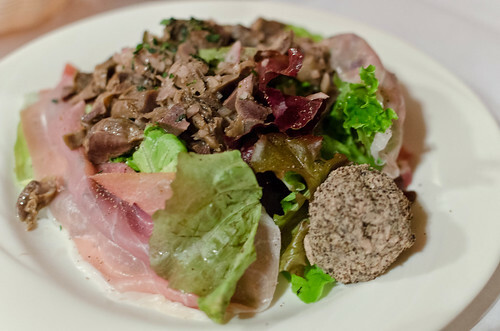 The plate arrived with a mound of mixed greens piled on, topped with confit chicken gizzard, surrounded by a couple of paper-thin slices of Bayonne ham, with a truffle of peppered chicken liver pate, and finished with a light dressing of a decent tangy vinaigrette. BFF and I were amazed at the tender bits of gizzard whose flavor was intensified by the confit (cooked in fat), the liver paté truffle smooth, rich, and pungent from the pepper, and the paper-thin ham tasted aged and musty from the barn that it was cured in, which is a good thing in this instance. Here, we see in this dish the roots of Modern French cuisine stemming from country fare that are well done and sensitive to quality ingredients – hearty yet sublime. 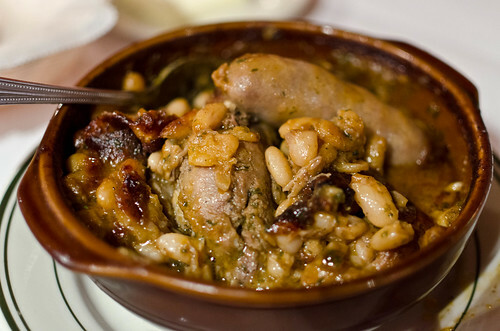 For my main course (let’s not confuse it with the American misuse of the word entrée) I decided to order something that I rarely come across in the menu of most French establishments – Cassoulet Languedoc. This hearty stew consists of French white haricot beans that have been stewed in a rich sauce and enriched by healthy chunks of duck confit (cooked in duck fat), lamb, pork, and Toulouse sausage. This is a hearty gut-sticking food that speaks of the humble origins of this unfussy dish. The beans were cooked just right, being not too soft and maintaining its integrity without being chalky firm, while the sauce it swam in was flavored by some aromatics and a good dose of woodsy thyme. The various pieces of meat lent their own distinctive flavors to this dish from the rich duck confit, to the slightly gamey lamb, the pieces of porcine delight, and the flavorful and slightly fatty sausage. The earthen bowl that the dish was served in added to the character of the dish that took this diner to a remote French farm where this stew would often be cooked. In addition to my fawning over the unctousness of this bean dish, I admired the restaurant’s offering this time-consuming dish that many places would avoid serving. 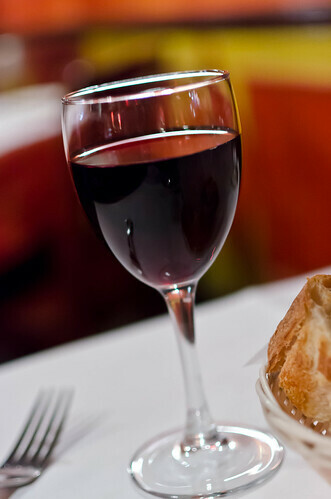 This is classic Languedoc fare from the Southwest France, and with this dish this restaurant delivers. As a treat for my birthday on my first visit, I decided to indulge in the dessert special for that day. 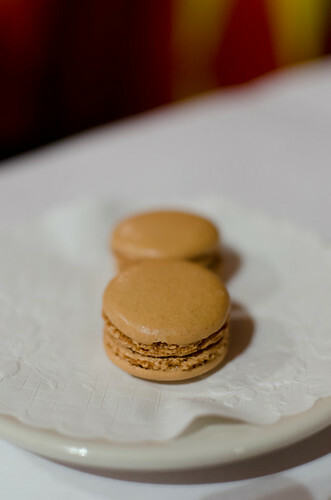 It was offering an array of macaroons, and my order consisted of a couple made from coffee. These were two perfectly round crispy yet crumbly discs made from merengue flavored with some coffee essence, stuffed with a creamy filling again flavored with the same heady coffee essence and with some nutty crushed hazelnut bits mixed in. They were the perfect sweet bites to end the meal after having sated myself with the above rich dishes. Small, sweet, and satisfying. 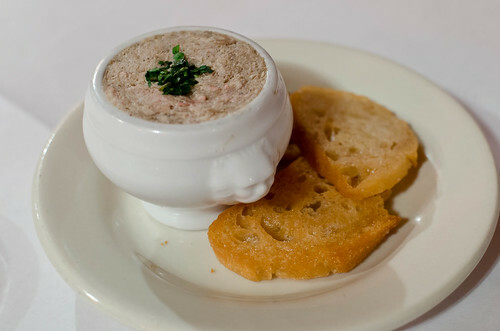 As part of the Pre/Post-theater $25 three-course deal, I decided to start my meal with a Duck Rillette Paté. A small bowl of this rich meat paste came served with a couple of the house-made croutons. Pieces of shredded duck confit meat have been congealed with duck fat and heavily seasoned with black pepper. The pate was smooth and quite meaty with a good dose of pepper bite in each bite. The croutons were not enough to cover the amount of paté but the day was saved by the French bread slices. However, I got a bit bored by the rich dish as the amount was rather generous, and the addition of some herbs or the heady truffle would have made it more interesting to my palate. 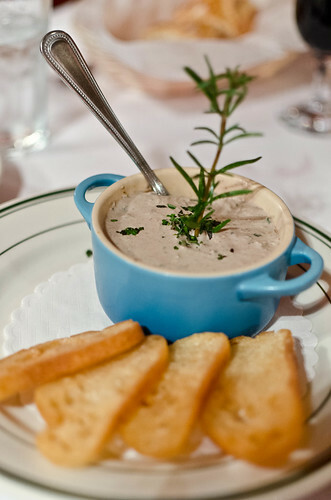 But I appreciated the rusticity in this version of pate which is the hallmark of this regional French cuisine. For my second course, I order Salmon in a Butter Red Pepper Sauce. 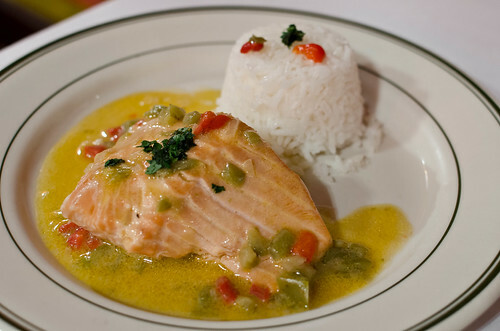 The moderate-size piece of salmon arrived napéd with a butter sauce studded with bits of sweet red and green peppers. The piece of fish was moist, flaky, and perfectly cooked from having some time in the oven, complemented by a surprisingly light buerre blanc that added a richness to the salmon. The chiffonade of fresh basil added a surprising anise flavor to the sauce and interesting touch to the dish. The accompanying white basmati rice was well cooked with a tinge of salt to elevate it beyond pure starch. A few capers thrown in to the sauce would have made the flavors perfect, but I was very satisfied with this dish and its skilful preparation. To round off this set of trio, I chose the Rasberry Mousse Bavaroise as my last course. 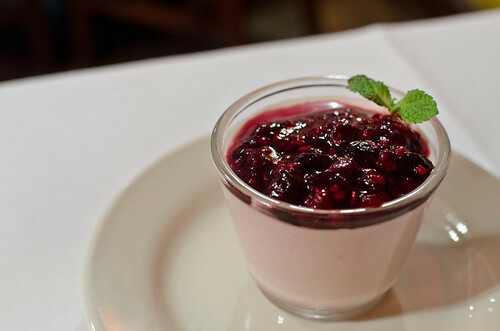 A glass arrived filled with the egg-cream-gelatine mixture at the bottom topped by a fairly thick layer of rasberry-blueberry compote. The creamy bottom was filled with the raspberry flavor while its airy lightness somehow managed to defy the richness of the custard. The topping was packed with soft chunks of cooked fruit providing the sweet fruitiness that paired perfectly with its bottom counterpart. This was the perfect finale to the three-act meal that was satisfying with the flavors, made with moderate sized portions, and they were a demonstration of the kitchen’s knowledgeable skilful cooking. This $25 deal is worth driving early to the city or visiting after a night out for a play. Bistro D’oc is a downtown location that offers unfussy, tasty, and skillfully cooked food that pays tribute to the Southwest region of France, the region from which the owner’s patriarch claims his roots in his homeland. 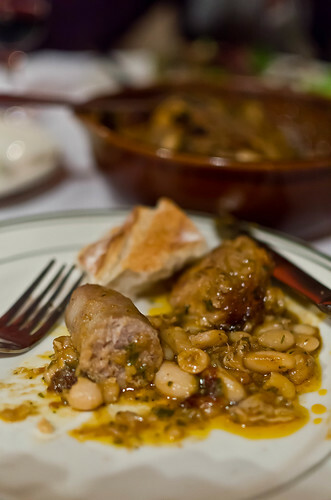 The dishes possess a level of humble earthiness while exuding a level of sophistication that is expected from French cuisine, a fare that can rarely be found in other places like the hearty Cassoulet, the rich Duck Rillette Paté, and the gizzard studded Salad Languedoc. This place is replete with a warm and welcoming ambience that makes the diner most welcome without feeling the stuffiness that can be found in some establishments. With their interesting and enticing offerings,the dinner specials, and the $25 deal, Bistro D’oc will see this diner popping in through their doors quite frequently in the future to savor this delicious French fare that speaks to the soul. C’est bon! Sounds like you and your great friend had a most splendid dining experience. How did it compare to K Town Bistro and Yves Bistro? Thanks, Gino. I like all the above, and they all offer a different perspective of this wonderful cuisine. What I enjoy most of Bistro D’oc is the earthiness in their country fare that is French soulfood. Not many places offer this kind of menu. Thanks Alex for sharing this blog article. I posted it on my Facebook Timeline as the Foodie Pick of the Week! What a lovely dining experience! I love that you shared it with us…hope you’ve been well!! Thank you. All is well. Hope the same with you.